The giant saquaros and the desert are the theme of my landscape. 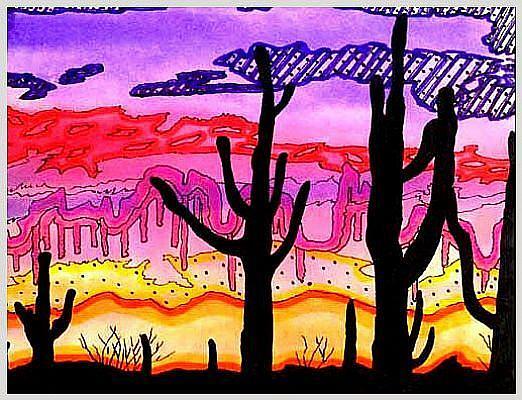 The sun is setting very slowly in this piece and so the saguaros are depicted in silhouette. This semi-abstract mixed media painting is on watercolor paper and was rendered in watercolors and felt tip markers. I think what impressed me most about Arizona when first we travelled there was the heat and the saguaros. They are present everywhere. Out in the desert, on the lawns of many of the residents, or just here and there where you'd least expect to see them. Sometimes even in the corner of a parking lot somewhere. I even saw one on the back of a truck on the highway being delivered to a home as part of their landscaping scheme.